Moreton-in-Marsh station's first platform extension has taken shape in just over a week. Contractors Dyer & Butler began work to lengthen platform 1 at the station over the weekend of October 13-14 and just a week later much of the main structure was complete, with a few sections of platform decking to be fitted, before drains, fencing and lights were added. The extension runs south from the station building as far as the former goods shed, which is now used by Network Rail's local maintenance team as a depot. The work has been done overnight, when trains were not running. Network Rail held an information event in the town earlier in the month to let residents living near the station know what was happening and why the work needed to be done. Once complete, the platform will be able to accommodate seven coaches of GWR's new Class 800 and Class 802 Intercity Express Trains, which can operate as single five-coach and nine-coach trains, or as 10-coach trains formed by coupling two of the five-coach units. In future, most services on the Cotswold Line will be formed of five-coach or nine-coach single IET sets, but the platform extensions will allow 10-coach trains – formed by coupling two five-coach sets together – to be operated in peak periods if required, by allowing doors on part of each set to be opened at stations. Platform 2 at the station, used by trains towards Oxford and London, will be extended later in the autumn. 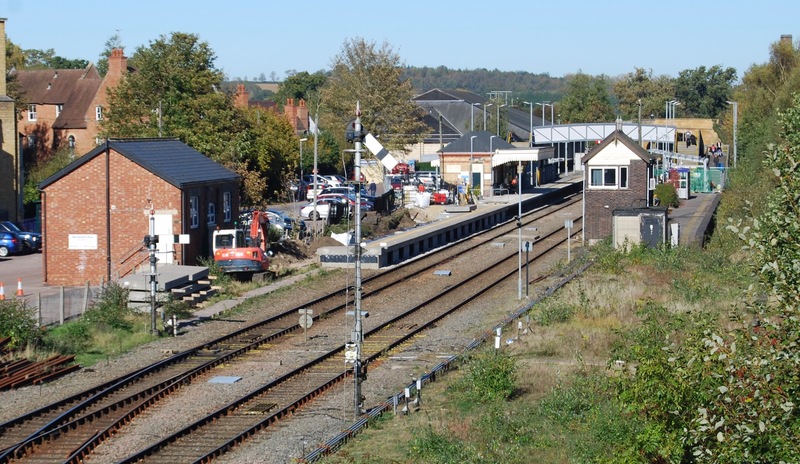 The Cotswold Line will be shut between Moreton-in-Marsh and Worcester from Saturday, November 17, until Sunday, November 25, inclusive, while work takes place to extend the platforms at Honeybourne, Evesham and Pershore stations. Click here for more details and information about replacement buses and alternative rail routes that can be used during this closure. Details will follow later in the year about work over Christmas and New Year to extend platforms at Charlbury and Hanborough.